CLICK THE IMAGE TO TAKE THE SURVEY! Pinal County is divided between two MPOs and one COG. All three planning agencies have completed Strategic Transportation Safety Plans (STSP) for their respective planning areas. Pinal County is now developing a STSP that would combine relevant recommendations from all three safety plans and also meet current federal requirements for the Pinal County planning area. A cohesive plan for the County will help fill any gaps that may exist in the existing plans, such as the identification of specific regional safety projects for the Pinal County communities of: City of Maricopa, Gila River Indian Community, Ak Chin Indian Community, Town of Florence, San Tan Valley, City of Apache Junction and unincorporated areas in Pinal County. The Pinal County STSP will address the necessary steps and elements, from a regional transportation planning perspective, to reduce the risk of death and serious injury to all transportation users in Pinal County. The Sun Corridor MPO, in partnership with the Maricopa Association of Governments (MAG) and Central Arizona Governments (CAG) is funding a Strategic Transportation Safety Plan for Pinal County utilizing Local HSIP funding from all three planning agencies. This project will develop a customized regional plan for Pinal County in order to address the issues and needs for Pinal County and its transportation users. The Pinal County STSP will be developed in close coordination with Arizona’s Strategic Highway Safety Plan (SHSP). This will ensure that federal requirements are met, statewide/local consistency is prevalent, and unique regional needs are addressed. The second STAC meeting was held in Florence on June 13, 2018 in preparation for the the upcoming Public meetings. The STAC was attended by 19 people including representatives from the County, Regional Planning Agencies, the Consultant team, Emergency Response, GRIC and several communities within Pinal County. The purpose of the meeting was to inform the STAC on the progress of the STSP as well as to get feedback and direction for the upcoming Public Meetings. The STAC Kickoff meeting was held in Florence on January 08, 2018 and was attended by 23 people including representatives from the County, Regional Planning Agencies, the Consultant team, law enforcement, GRIC and several communities within Pinal County. The Meeting detailed the purpose of creating the STSP, objectives of the STSP, tasks and schedule involved in completion of the STSP and covered some preliminary crash data analysis for Pinal County. 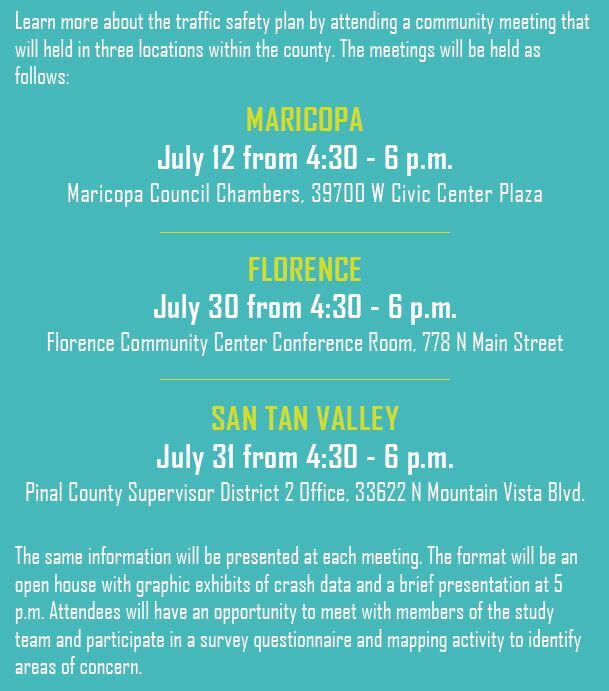 Three Public Meetings have been held so far; July 12 in Maricopa, July 30 in Florence, and July 31 in San Tan. The meetings were an open house style format that allowed members of the public to interact with the study team, review crash maps, and learn how to provide additional input regarding potentially unsafe locations in Pinal County. The Study Team also provided a brief presentation, which are linked to below.